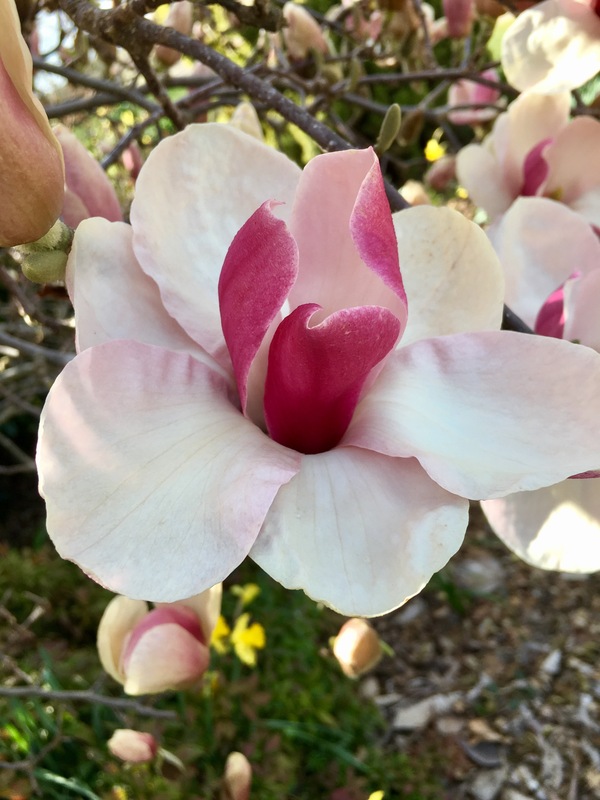 I have written before how much I love Spring, the flowers, the colour, the new life and in particular my magnolia tree. I always take copious shots hoping for one that’s just right. So you can imagine how wrong I felt turning this one into black and white for Week 11 of our 52 week photography project. The theme this week was Black and White. It seemed almost sacrilegious to take a photo of my magnificent magnolia flowers in black and white, but I must say I was surprised at how much I liked the end result. Black and white has a certain power; I feel the magnolia’s beauty shines through. This week’s photos were another great mix of everyone’s black and white personalities. We had shots of London, sculptures from a Tulip Festival, a studio shot, a bike riding partner, a cryptic crossword puzzle, a black shoe/white sock combo as well as my magnolia flower. You’ll have to click the link to go and check them all out. My alternative shot this week (I always seem to have two to choose from) was the Australian Marriage Law Postal Survey which is happening at the moment at the ludicrous cost to the taxpayer of $122 million dollars. It’s a black and white issue for many. And yes you read that right – $122 million! You may not realise (like me) that WordPress decided to show their support for marriage equality by displaying a rainbow coloured bar on all Australian blogs during this period. Apparently it cannot be removed for individual sites and they say they respect everyone’s rights to publish the content you choose to your site but the navigation bar styling reflects WordPress.com’s stance as a company. The rainbow bar will remain until after the survey results are released on November 15 2017. I had noticed the rainbow ribbon on my blog but didn’t know what was behind it until I did a search. So it seems it’s not all black and white after all! It’s turned into a bit of a family affair actually with my sister Sharon, who takes amazing photos of flowers among other things; my brother-in-law Tim, who takes gorgeous shots of everything; my nephew Daniel; a talented photographer; my husband Grant who started photography back in the old days of film and DIY developing and processing; my daughter Melanie, who is a travel blogger and photographer; as well as Alison, a close friend of my sister’s who is an experienced wedding photographer. You can read more about us all here on the About page. I especially enjoy the regular contact it gives us all too and the connections we make each week. I’ve been assured it’s all about creativity, not necessarily photographic expertise. I am enjoying the challenge of looking for suitable shots as soon as the next week’s theme is announced, it takes over my thinking until I’ve taken my shot and sent it in. Then I can relax a bit! It’s also fun wondering what the others will come up with, you just never know what you’re going to get! Each week we are given a new theme and must take a photo, add some words and submit it to Tim who will compile a post on Sunday night. He then tells us our next theme…and so on for 52 weeks! We all enjoy a bit of a comment session after the post goes live which is always fun. Happy photographing! Let me know what you think of our photos this week, as always I appreciate your thoughts. You can also find Deb’s World here – come join me. I wondered what the rainbow banner was all about Deb. Now I know. I’m not surprised. Despite voting yes it’s a bit presumptuous. Yes I agree it’s hard to do properly but I’m still enjoying the learning process and having fun with it. I prefer the colour shots of magnolias too. All good – thanks for the feedback! I agree with Mariam. Even though the marriage equality question is black and white to me, it is still shockingly presumptuous of WordPress to impose their views on everyone’s site! It’s strange Donna, that nothing was said about it either.